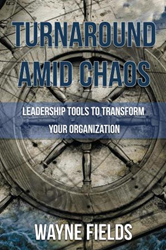 Within the pages of Wayne Fields’ new book, Turnaround Amid Chaos: Leadership Tools to Transform Your Organization, ($15.49, paperback, 9781545610558; $7.99, e-book, 9781545610565) readers will peek over the shoulder of CEO Tom Peterson on his journey of corporate leadership challenges. Core leadership lessons and an appendix with practical resources equip leaders to transform their workplaces and achieve personal fulfillment. Wayne Fields holds a Master’s in Leadership Development from Lancaster B. College and is President/CEO of Oliver Gospel Mission with more than twenty-five years in Executive Leadership. He is Founder and President of Reality Ministries LLC, and Chairman of the Board of Directors for Beyond the Diamond. Xulon Press, a division of Salem Media Group, is the world’s largest Christian self-publisher, with more than 12,000 titles published to date. Retailers may order Turnaround Amid Chaos through Ingram Book Company and/or Spring Arbor Book Distributors. The book is available online through xulonpress.com/bookstore, amazon.com, and barnesandnoble.com.